First flown in May 1958, the Phantom II originally was developed for Navy fleet defense and entered service in 1961. The USAF evaluated it for close air support, interdiction, and counter-air operations and, in 1962, approved a USAF version.The USAF's Phantom II, designated F-4C, made its first flight on May 27, 1963. Production deliveries began in November 1963. In its air-to-ground role the F-4 can carry twice the normal bomb load of a WW II B-17. USAF F-4s also fly reconnaissance and "Wild Weasel" anti-aircraft missile suppression missions. Phantom II production ended in 1979 after over 5,000 had been built--more than 2,600 for the USAF, about 1,200 for the Navy and Marine Corps, and the rest for friendly foreign nations. In 1965 the first USAF Phantom IIs were sent to Southeast Asia (SEA). The first USAF pilot to score four combat victories with F-4s in SEA was then-Col. Robin Olds, a WW II ace. The aircraft on display is the one in which Col. Olds, the aircraft commander, and Lt. Stephan B. Croker, the backseat pilot, scored two of those victories in a single day, May 20, 1967. The armament loaded on the F-4C shown here consists of four AIM 7E and four AIM 9B air-to-air missiles, and eight 750 lb. Mk 117 bombs. The aircraft is also carrying two external 370 gallon fuel tanks on the outboard pylons and one ALQ-87 electronic countermeasures (ECM) pod on the right inboard pylon. This was one of the typical armament configurations for the F-4C during the Vietnam War in the summer of 1967. The F-4EJ was ordered on November 1, 1968. Two F-4EJs (JASDF serials 17-8301 and 17-8302) were built by McDonnell in St Louis and tested beginning on January 14, 1971. The next eleven (JASDF serials 27-8303/8307, 37-8307/8310, and 47-8311/8313) were built by McDonnell in kit form and were assembled in Japan by Mitsubishi Heavy Industries, Ltd. The first Japanese-assembled aircraft (27-8303) flew on May 12, 1972. Subsequently, Mitsubishi built 127 F-4EJs under license, the last example being delivered on May 20, 1981. This was the last Phantom built. 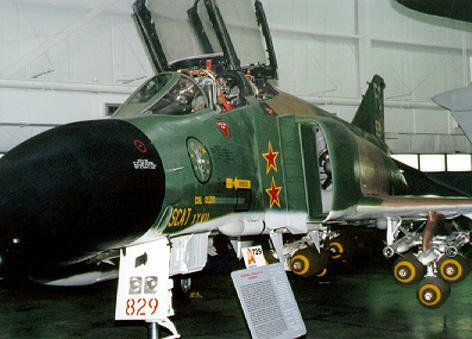 An F-4J, "Showtime 100", from VF-96, was flown by Randy "Duke" Cunningham and his RIO Willie Driscoll when they were credited with 3 kills on 10 May 1972, one of which was the reputed leading North Vietnamese ace Colonel Nguyen Dinh Ton. This was the Navy Phantom's big day in the skies over Vietnam. Flying from the USS Constellation, sister squadrons VF-92 "Silver Kings" and VF-96 "Fighting Falcons" blasted seven MIGs from the skies between them while a VF-51 crew shot down another. Air Force Phantoms accounted for another three MIGs that day.